A Life On--and After--the Farm: One Lovely Award! Last night (or this morning - however you look at 1am) I was sweetly surprised by a note from Lille Diane. 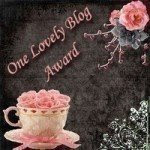 We have recently discovered each other, and I guess she must enjoy my blog as much as I enjoy hers because she chose me to receive this lovely 'One Lovely Blog' Award! The rules for sharing this award are different than other awards because instead of passing it on to just anyone, you are supposed to pass it on to NEW to YOU blogs you've just become familiar with, which is very, very cool! 1) Accept the award, post it on your blog together with the name of the person who has granted the award, and his or her blog link. You can also make a comment about the person who gave the award to you by asking your readers to stop by their blog, pay them a visit, leave a comment, or even 'follow' their blog if they feel led to. 2) Pass the award on to other blogs that you’ve newly discovered. Contact these bloggers to let them know they have been chosen for this award. Just go to their site and leave a comment to one of their posts telling them you have an award for them and to please come by your blog to get it. Just a little note: You pick the number of blogs to pass the award to, just give it to those you have recently discovered. A second note, I am not passing this award along as much as I am giving you, my followers, a list of blogs to check out and hopefully follow. I know some of those I have selected may prefer not to participate in this little exercise and that is fine, no problem. 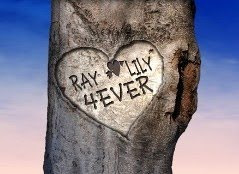 Please visit these blogs and if you leave a comment maybe say MzzLily sent you. A lot of my newly discovered blogs have already just received this award. Lille Diane would have surely been on my list, had she not been the one to award it to me! Then there is Jase at foolstop who also just received it... Well, you get the picture. scribbleinkcafe AmyPlaton is hoping to soon be a published author. Her topics vary from the adorable from-the-mouths-of-babes story to letter-to-the-editor style. She welcomes comments (don't we all) and polite debate. A delightful and educated woman. room304englishteacher I loved her last post on the empty desks! I find her writing entertaining and her spelleng und grammer mmpeckable:) And who doesn't love an English Teacher? The Business of Being a Mom Saving the best for last... Traci Weldie is someone that I've been following a bit before I found her blog. I am friends with her in-laws and learned about her remarkable life through them. She is a very devoted mother to four biological children and, most importantly, a child of God. God led them to the decision to adopt a fifth child, George, a seven-year-old boy from Ethiopia. Her blog offers a frank discussion of the hurdles she, George and her family must overcome in this process. My heart has been uplifted and ripped apart by her words. She is brave and honest, and worth a read. Congrats. It's such a pretty award. It sits real nice here on your shelf. Congrats to you and thanks for thinking of me. You're the best! Congratulations. Don't you just love this award, it is such a wonderful way to spread the word about new friends we have met in the blogging community. Have a great day and as Amy said, you're the best.